Hi..I add asked about your skincare regime, but just read all your previous posts and found out what you use. I am excited to make the olive oil remover..also, congratulations on your wedding. You two make a beautiful couple! oOooOoO sooo nice! I want one! Oh I love this!!! I wish I could get this but I have just way too much makeup - check out my blog and you'll see!!! But I love that box with the compartments.., it's sooo pretty!! How pretty! The drawers hold a lot more than I thought it would! Cute! i have been looking for some storage for my make up! those seem great! I love your blog! New reader here. I know exactly how you feel about organizing, planning, and all of that good stuff since I enjoy doing it too. 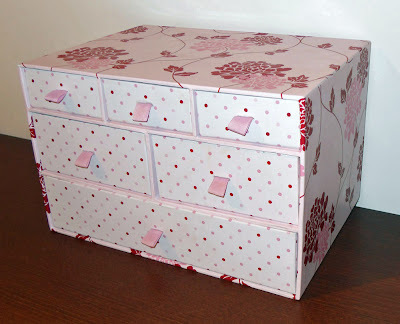 latinainglesa from YouTube has this exact same Laura Ashley storage for her makeup. I love the drawer set you have for your makeup, but this isn't available where I live. Is there some way I could buy this item somewhere else??? I looked on Ebay & they had sold one, but the auction was over though it wasn't as pretty as yours. however couldn't uncover one, I would really like to develop into a fan!